Did you know that there can be dangerous levels of heavy metals in cosmetics? It's a real concern that you should be aware of. Here's what you need to know about this serious problem and what you can do about it. 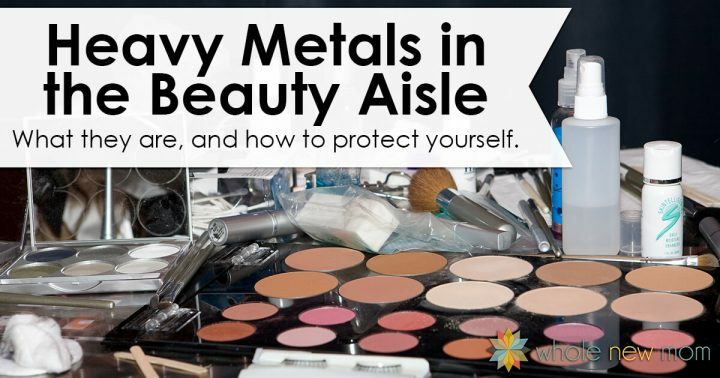 I've been concerned about heavy metal toxicity for a long time, but I never thought about heavy metals in cosmetics. I mean, I've know about mercury in fish and in fluorescent light bulbs, and lead in paint, but heavy metals in makeup? 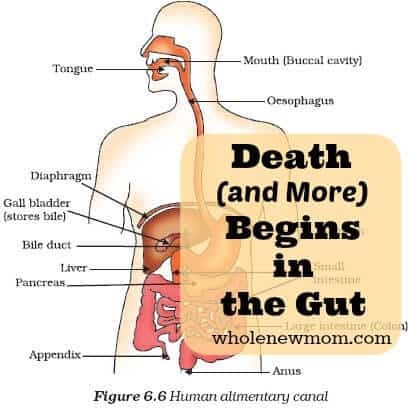 For years I have seen different natural practitioners for things like candida, thyroid disease, adrenal fatigue. And several times a practitioner would mention mercury or other heavy metals as being an issue. I didn't really know what to think. I got my mercury fillings removed (even though I didn't have many and they were really small), and took zeolite which for sure showed that I had some kind of heavy metal problem (when I took it, my urine smelled like metals for two weeks), and later did a program that was supposed to help my body release the metals on its own. I'd also heard about chelating metals via an IV, but was pretty concerned about the safety of that method. One thing kept bothering me…..
Where was all of this metal coming from? Lead, Arsenic, Cadmium, and Mercury are the metals that are of the greatest concern and they are linked to all kinds of health problems. When you think about heavy metals, typically you think about their presence in water, soil (we got our soil tested when we planted our gardens), cigarette smoke, paint (lead), vaccines, and fluorescent bulbs. One thing I never thought of was my foundation or my mascara. Would you believe that heavy metals might be lurking in your beauty products? I wouldn't have thought so either, but it's true. Even if there were “safe” levels determined for these products, when you add up the exposures that most women get between multiple beauty products and other exposures (think the air, water, food, bulbs, etc. listed above), then toxic levels can be more easily reached. Now, I'm not a big makeup kind of gal, but I've worn a little throughout the years, and as I've gotten older I've worn a bit more –some foundation, an eye pencil and some mascara. About 3 years ago I started switching over to more natural, organic products, and even tinkered with a few DIY versions. It's been a long road, trying many brands. And revisiting some again and again to really figure out what I like. I'm glad that I have found some products that work for me, without sacrificing my health. Basically, you need to get informed. Know what's in your products and know your manufacturer. And what about DIY / Natural / Organic Cosmetic companies? If you've been around Whole New Mom for awhile, you know that I LOVE making almost anything from scratch, from coconut milk to weed killer. Well, I love the idea of DIY personal care products too. I make my own Eye Makeup Remover, Body Wash, and Hair Rinse, and even bought the ingredients to make my own face powder and foundation this past year. But now I am not so sure I'll be using it. In fact, I just sent the manufacturer an email asking about heavy metals in the iron oxides, etc. that I purchased to see what they have to say. 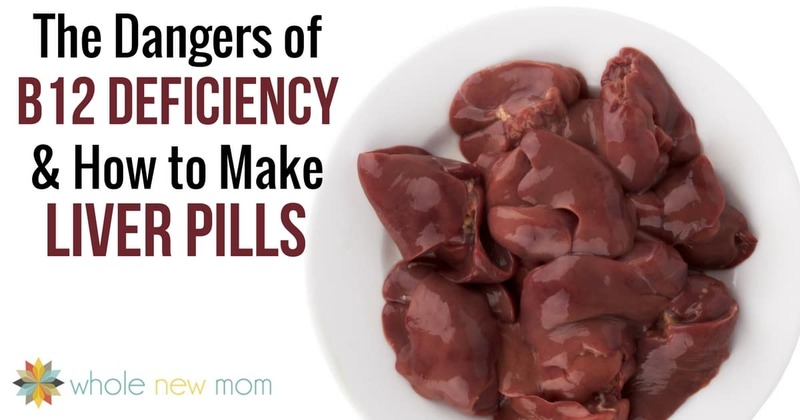 Because mercury, lead, arsenic, cadmium, and more–they're all natural products. So even if your products are “natural” or “organic” or DIY, if they have metals in them, they can still harbor dangerous heavy metals inside at unsafe levels. 1. Skip the Color Cosmetics – well, maybe. If you want to completely avoid heavy metals, you just might have to avoid color cosmetics completely and skip the whitening creams too. Whitening toothpastes have also been known to have heavy metal contamination / ingredients too. 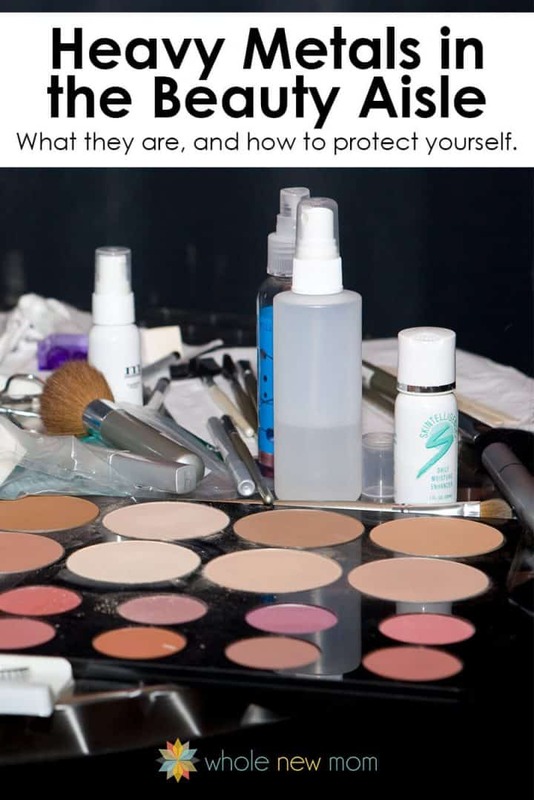 To be as safe as possible, skip the foundation, the blush, the eye pencil, the lipstick, the lip gloss, the mascara, and the eye shadow. Unless you can find a line of products that uses only plant-based colors. Keep reading….. But if you, like me, want a little color on your face, then you need to do your homework. Go to Environmental Working Group's Skin Deep directory to see what is in your products. Keep in mind, however, that only ingredients are listed — not contaminants. So what is listed on the label is only part of the picture. Contact different companies and see what they have to say about heavy metals and their products. Ask if they batch test and what the presence is of heavy metals in their products. I buy my cosmetics from several companies, since I don't think that one size really fits all, unless you're talking an umbrella :). But most of my makeup comes from Beautycounter. Beautycounter tests every single batch of their products for the presence of heavy metals — they're that serious. At Beautycounter, we third-party test ALL of our color products for heavy metals before we bring them to market. We strive to achieve undetectable levels of heavy metals in our products (undetectable level ranges from 0.5 to 5 parts ?per million, depending on the metal). We only proceed with shades that do not exceed our extremely low “allowable thresholds” for background heavy metals. Believe me, in the world of color cosmetics, that's a lot of testing. And beyond that, not only are their standards high, but their makeup performs fabulously. Christy Coleman is a world famous makeup artist, and she is behind all of the cosmetics at Beautycounter. She's done covers for Teen Vogue, Elle, Glamour, and more. She knows what looks good. Her goal is to have Beautycounter's makeup to be good enough for the runway, and perfect for every day as well. Beautycounter's mascara is practically waterproof without being toxic! Beautycounter's lipstick is the only one I have ever been able to wear. My personal faves are Petal and Twig, with Terra being a close third. Beautycounter also has a fabulous 60 day return policy, so you can buy without risk. And I bet you'll love your purchase. Here is a very informational graphic showing the concerns of heavy metals in cosmetics, as well as how you can avoid the dangerous risks. Read more here about what I love about Beautycounter. No matter where you shop, make sure you do your homework and keep the heavy metals off of your face — 'cause no one needs that stuff in their makeup. What brand of cosmetics / beauty products do you use? I was shocked when I heard that traces of lead were found in many popular lipstick brands. Some researchers claim we’d need to eat 1000s of lipsticks in order to develop lead poisoning. But why risk it when we don’t have to? I’ve heard great things about Beauty Counter – I really need to check them out! I’m glad their standards are so high. I’ve also heard a lot of praise about 100% Pure’s lipsticks. Thanks for recommending the Skin Deep directory. I also think consumers should learn as much as possible about ingredients (and potentially harmful natural products like heavy metals too) to stay informed. Thanks again for recommending Beauty Counter – can’t wait to try it out! I just received an email promoting metallic make up and I found it scary, so I googled ‘metals in make up’ and saw this article. There are certain metals needed by your body during the metabolic process and during respiration and they are there by nature. When you start adding these heavy metals they get absorbed into your blood stream and over a period of time, problems ensue. I guess most people don’t realise that the skin has blood vessels and that’s how it gets its nutrients. This explains why a lot of people who use these make up on a regular basis look way older than their age. If the FDA is not involved, maybe it should look into it and protect consumers. People seem to care more about animal products in cosmetics when they should pay more attention to the toxins we put in our system for the sake of looking ‘ beautiful’. Thanks for your article. You are so welcome. Yes, you are right about the heavy metal implications on health. Not sure about people using makeup looking older but that’s interesting. Beautycounter is trying to to do what it can. Hard to know how much to have the government do since gov’t oversight can be a problem, but in this case I think it’s needed. Thanks again! Hi Adrianne, have you any updates on 100% pure? Yes I had a lot of back and forth with them. They sent me some products to sample and I signed up as an affiliate. However, the hair products smelled very very strong so I asked why since the label said only “coconut” on it. They initially told me that it was coconut essential oil but that doesn’t exist. Finally, after a long back and forth they said it was heat extracted coconut extract. My understanding, after talking w/ a skincare expert, is that there is no such thing but I can go back and check. She said that there is another extract but it’s very expensive and not that strong so you would have to use a lot of it to have an intense smell. 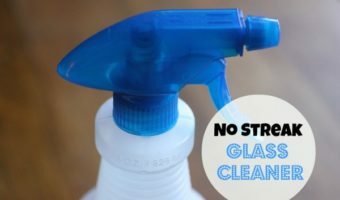 I smell the same smell but I think stronger in Shea Moisture and both products make my chemically sensitive son react badly. I can’t use them and I can’t in good conscience recommend them so I removed them from my blog. If you are looking for other options please reach out to me here or via email. Thanks for reading. Hello again and thank you so much for your quick answer. I have started to read, the gather and check a huge ammount of info with hope to find a 100% natural, non-toxic and not harmful cosmetics.its all started after I’ve been pregnant and since than Im really struggling to find a company I can trust. I’ve been cheking every single ingridient in order to find something i can you with no worries and the only one that seems to use only natural ingridients Was 100% pure. I really dont know har to do at this point ‘ cause not to use make-up it isreally NOT A OPTION, cant immagine to go out with no make-up ? Serious company should take its clients seriously and what you experienced it si really dissapointing me…. is it possible you have been taking to somebody who doesnt have that kind of knowledges and is just responsable of communicatin etc? I haven’t tried their products yet, but they are very clean. They haven’t assured me of batch heavy metal testing so in that sense I would lean towards Beautycounter. This one has a LOT of brands and many are not as clean as you seem to want, but the RMS brand would meet your needs I think. Again, I don’t know of any company that batch tests for heavy metals but I think these would be good options to consider. You are very welcome. I understand your thoughts about Beautycounter. They do not purport to be organic or all natural. Their aim is to be much safer than mainstream skincare and beauty products while performing at a high level. Their head of creative design, Christy Coleman, is well known for her talent and her contribution to the company yields color cosmetics that are simply lovely. I hope that clarifies :). Sorry to disturb you that much, but would you be so kind to answer just one more question about 100 % pure? Do you know something about their certifications for heavy metals of if they ? There is a long story on their site about how they test for this and that but no word about heavy metals. Thank you and sorry for taking your time. I have no knowledge that they do any of that kind of testing. They state on their site that they don’t have synthetic colorants and mention that they can contain heavy metals. However, iron oxides, etc can as well and they do mention that their products do / might contain those. They have a lot of products so I haven’t gone through all of them. Thanks for the kind words! Hi, what do you think about the 100% Pure makeup company? I am trying them out soon. I used their eye cream in the past and that didn’t work well for me, but trying other things next. Have you tried them? Thoughts? UPDATE 5/18/17 I will not be recommending their company for various reasons. Hello there. Update – I am digging into them and am having issues with their fragrances. I can’t get the answers that I need about them. I hope to have more information but they are saying that they have a heat extracted coconut extract in their hair products and I can’t find such a product anywhere on the internet so I’m stumped. I have talked to a soap company that didn’t understand either as well as another extract company so I want to talk to one more. It’s a puzzle and I’m not comfortable yet. I am happy to help with other companies but so far can’t recommend this one.